Very pretty little jug. Backstamp Aladdin Adams Estd 1657 England. Excellent condition. Lovely little jug with lid. Backstamp: Aladdin Adams Est 1657 England. A little roughness under the lid otherwise excellent condition. Lovely little jug featuring Abraham Lincoln from New Salem on one side and First Berry Lincoln Store on the other. Backstamp: Old English Staffordshire Ware Johnroth England. Minor firing fault to the inside rim otherwise excellent condition. 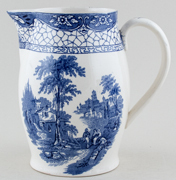 Traditional straight sided tankard jug. Hexagonal jug. Backstamp: Baltic Adams Est 1657 England Hand Painted on Real English Ironstone Decoration Completely Underglaze Acid and Detergent Proof. Light all over crazing. Large hexagonal jug. Small rub to the end of the spout otherwise excellent condition. Ironstone. Backstamp: Adams Made in England. Excellent condition. Small jug with a touch of crazing otherwise excellent condition. 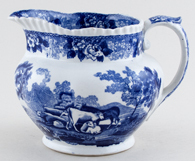 Lovely jug with delightful rural scene either side of the body and lovely floral border. Backstamp: Est 1657 Adams Cattle Scenery England. There is some blue smudging, mainly inside. Also a little minor wear to the rim and handle and underneath. Lovely rural scene of cattle, horse and sheep on this jug with pretty floral border around the rim and along the line of the handle. Backstamp: Adams Cattle Scenery England. Light all over crazing and inside there is some discolouration. A lovely round jug with gently moulded body and white gadrooned rim. Backstamp: With Compliments E G Wade "White Horse Hotel" Xmas 1927. Lovely jug with delightful rural scene and gorgeous floral detail around the rim and along the line of the handle. Backstamp: Adams Est 1657 Cattle Scenery England. This is an absolutely fabulous large jug. Delightful rural scene of cattle, sheep and a horse each side of the body, with a white gadrooned rim. Backstamp: Adams Cattle Scenery England. A little crazing and the pattern on one side and to part of the inside rim very blurred. Lovely rural scene of cattle, horse and sheep on this jug with pretty floral border around the rim and along the line of the handle. Backstamp: Adams Cattle Scenery WA & S Ironstone Estd 1657 England. There is a little wear to the rim and just a touch to the foot, overall excellent condition. Attractive helmet shape jug or pitcher in this popular design, printed in the slightly steely blue rather than Royal blue. Lovely condition. There is a tiny nick on the rim, which occurred in manufacture and was glazed over. No maker's backstamp, but definitely Adams. Lovely jugs with white gadrooned rim, delightful rural scene and a very pretty floral border inside and outside the rim and along the line of the handle. 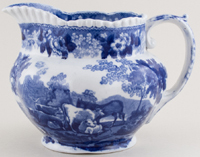 The largest and middle size jug have the blue printed Adams Cattle Scenery mark. The smallest has blue printed "With compliments from J H Keep", possibly a retailer, maybe even a milkman! The middle size jug is just slightly paler than the others. All in excellent condition. With white gadrooned rim and different vignette of pattern either side of jug. Backstamp: Rd No. 623294 This Pattern was introduced by William Adams in 1780 being a copy of a Chinese pattern & one of the first of its style produced in English Pottery Wm Adams. With white gadrooned rim and different chinoiserie scene either side of the body. Backstamp: Rd No. 623294 This Pattern was introduced by William Adams in 1780 being a copy of a Chinese pattern & one of the first of its style produced in English Pottery Wm Adams England. A little minor discolouration inside and to the foot a very small chip which will have occurred during manufacture and was glazed over. Small octagonal jug. No backstamp. Excellent condition. Delightful little jug with same bird pattern either side of the body. Backstamp: Chinese Bird Rd No 623294 Adams Made in England Established 1657 Real English Ironstone. Pattern a little smudged on one side otherwise excellent condition. Lovely ovoid jug with Chinese Bird one side and three Mandarins the other. Backstamp: Rd No. 623294 This Pattern was introduced by William Adams in 1780 being a copy of a Chinese pattern & one of the first of its style produced in English Pottery Wm Adams England. Light crazing and a little minor wear and small hairline to the rim otherwise fine. 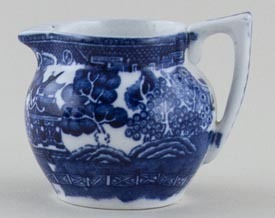 Dutch jug without the gadrooned rim that is usually associated with this pattern. Backstamp: Rrd no. 623294. This pattern was introduced by William Adams ..... Wm Adams England. There is some wear and discolouration to the rim otherwise excellent condition. Absolutely gorgeous little jug. Backstamp: Rd No 623294. There is a little minor wear to the tip of the spout and a small nick to the foot. Overall excellent condition. Delightful little jug. Backstamp: Rd No 623294, impressed Adam Tunstall. Crazed otherwise excellent condition. 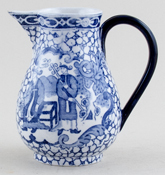 Delightful small jug with different chinoiserie scene either side of the body. Backstamp: Adams England. Excellent condition. Very pretty little jug. Backstamp: Reg. No. 623294 This pattern was introduced by William Adams in 1780 being a copy of a Chinese pattern and one of the first of its style produced in English pottery. Wm Adams England. There is a little minor wear to the foot otherwise excellent condition. Lovely ovoid jug with a different scene either side of the body. There is a little minor wear around the rim and a touch of crazing inside with a little discolouration, otherwise excellent. Oh dear the description makes this jug sound not so good, but it is in fact a lovely piece! Baluster jug with white gadrooned rim. Different pattern cartouche either side of the body. Backstamp: Rrd no. 623294. This pattern was introduced by William Adams ..... Wm Adams England. Excellent condition. Fabulous large jug without the gadrooned rim usually associated with this pattern. Chinese Bird one side and three Mandarins the other. Backstamp: Rd No. 623294 This Pattern was introduced by William Adams in 1780 being a copy of a Chinese pattern & one of the first of its style produced in English Pottery Wm Adams. A touch of very minor wear to the foot otherwise excellent condition. Lovely jug with white gadrooned rim and same bird design either side of the body. Backstamp: Reg. No. 623294 This pattern was introduced by William Adams in 1780 being a copy of a Chinese pattern and one of the first of its style produced in English pottery. Wm Adams. A few minor manufacturing blemishes, overall excellent condition. A fabulous jug with white gadrooned rim and different pattern cartouche either side of the body. Backstamp: Rd No. 623294 This Pattern was introduced by William Adams in 1780 being a copy of a Chinese pattern & one of the first of its style produced in English Pottery Wm Adams. The occasional minor blemish inside otherwise excellent condition. Absolutely gorgeous little jug. It has tiny tiny rub to the tip of the spout otherwise excellent condition. This is an early piece of Chinese Bird the only backstamp being part of the registration no.62329 - 4 is missing. Ovoid jug with removable weighted metal cover. Lovely condition. This is one of the largest jugs in this shape. White gadrooned rim and different pattern cartouche either side of the body. Excellent condition. 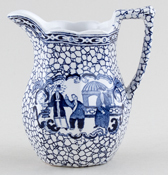 A pretty jug with a delightful romantic scene either side and unusual border pattern around the rim and to the handle. No makers marks just blue printed England, but we believe this to be by Adams. Excellent condition. Lovely rural scene of a horse with foal and pretty floral border around the rim and along the line of the handle. Excellent condition. Blue printed backstamp. Lovely jug with white gadrooned rim. The earlier version of this pattern with cows rather than horses. A little minor wear to the handle otherwise excellent condition. Typical blue printed backstamp Landscape, Adams. Lovely ovoid jug. Backstamp: Landscape Adams Est 1657 England. This is a continuation of a J Meir pattern featuring a series of Scottish Views. Backstamp: Northern Scenery W Adams & Co England. Loch Creran with Barcaldine Castle (Both are near Oban). There is a small firing fault to the handle otherwise excellent condition. This is a fabulous jug printed in a steely flow blue/grey. On one side a lady and gentleman sitting at a table and on the other two rather strange looking creatures! Excellent condition. Very small jug printed in a fabulous rich dark blue. Backstamp: Old Willow Adderley Ware Made in England. There is a tiny tiny firing crack where the handle joins the rim and a tiny nick to the foot rim. Delightful covered jug with cover. No backstamp. There is a little roughness to the rim of the cover otherwise excellent condition. This is a lovely jug with cover. Backstamp: Old Willow Adderley Ware England. Excellent condition. Lovely jug in excellent condition. There is just a small area where the transfer has smudged otherwise fine. Bone china with gilt. 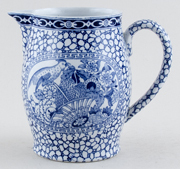 Delightful little jug printed in a mandarin blue. Backstamp: Adderley Fine Bone China England and in script H129. Excellent condition.